Some interesting features have come to light in excavations directed by Alan R. Hayden of Archaeological Projects Ltd on the site of a new Maldron Hotel on Dublin’s Kevin Street. 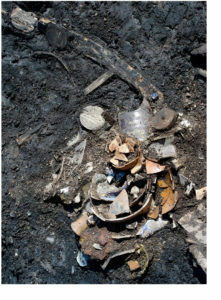 The clear remains—in the form of latrine pits (one of which contained a double toilet seat), buried barrels, pits, wells etc.—of medieval properties fronting onto Kevin Street and Clanbrassil Street were uncovered. These were abandoned in the fourteenth century, however, when the eastern half of the site became farmland and the western half was inundated to form a large millpond. We have never before seen such an abandonment of developed streets in the town—perhaps, given its date, a result of the Black Death. small bentwood boxes that would have been used to hold herbs or powders sold in the shop. 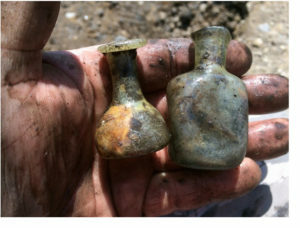 The pottery included at least six tin-glazed earthenware (TGE) drug jars, strainers, flat pans and footed pots for boiling or evaporating liquids, TGE bowls, a Chinese Krakware bowl, German stoneware Bartmann and Westerwald flasks and half a dozen small salve pots. 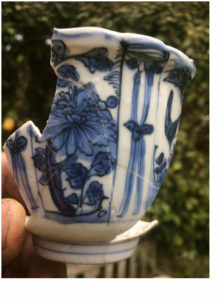 Some of these contained a yellow substance, and one was inscribed with the date 1639 before the pot was fired. Several oyster shells filled with chemicals and pots containing chemicals/powders were also uncovered. It appears from a cursory scan of the literature that an assemblage like this has never before been found in either Ireland or Britain, and so it is of considerable significance. The remains of a gable wall, well and latrine of a brick mansion built about 1680 and demolished by the 1730s were also uncovered. 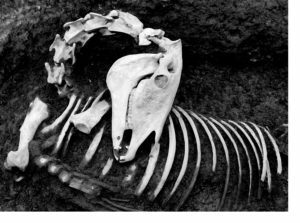 Near it, the remains of a complete horse, along with the fragmentary remains of another horse and a cow, were interred in an old sump pit in about 1700. 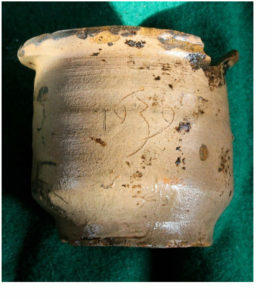 Images from top: the top of the pit; medicine phials; horse burial; Ming Krakware bowl; salve pot with date.